Since it appears from the hood studies that they don’t have the semicircular canals in their ears, this explains why pigeons can do the pigeon without confusing their balance? More broadly, I’m told vertebrates adapted to the ocean don’t have functional semicircular canals, so they can maneuver in 3D without ¿getting dizzy or otherwise directionally confused?, so maybe something similar is useful for flight? But something similar is obviously needed for walking especially in the dark, or maybe maintaining level flight (picturing especially the raptors and owls turning their heads in search of prey while maintaining level flight). Now I’m wondering if one of my college professors, who did the pigeon, was really more than half bird? Ok, now let’s check all dinosaur sacrals to find the same structure. First, all of those pigeons do have functional semicircular canals in their ears, but without visual input they have a hard time integrating balance information (as do we). Second, I think pigeons “do the pigeon” precisely to maintain balance. The head-bobbing is in sync with the hindlimb step cycle, and I suspect that it’s to keep the center of mass over the feet even though the hip joints are so far back on the body. Sorry if I blew your joke with serious answers! More broadly, I’m told vertebrates adapted to the ocean don’t have functional semicircular canals, so they can maneuver in 3D without ¿getting dizzy or otherwise directionally confused? Pretty sure that’s incorrect. 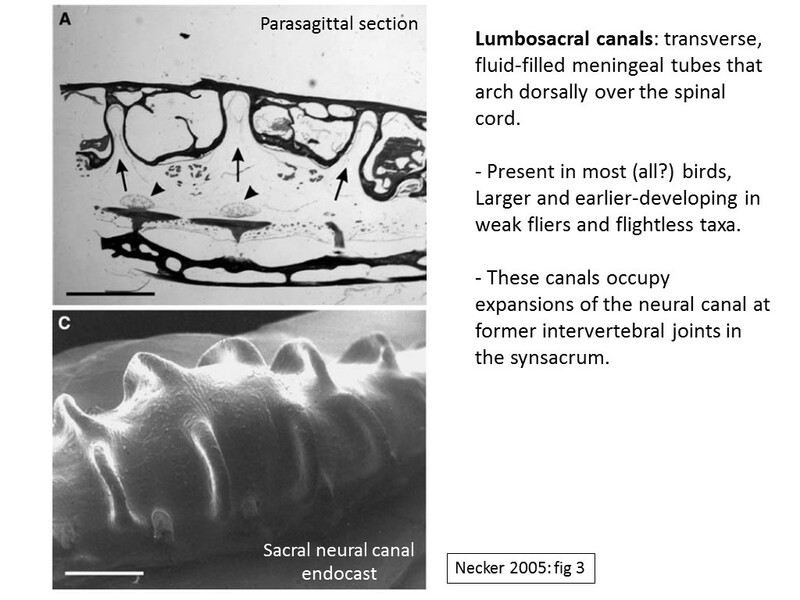 First, semicircular canals first evolved in an aquatic context, and second, there have been extensive studies of cetacean semicircular canals and they are small but definitely functional. 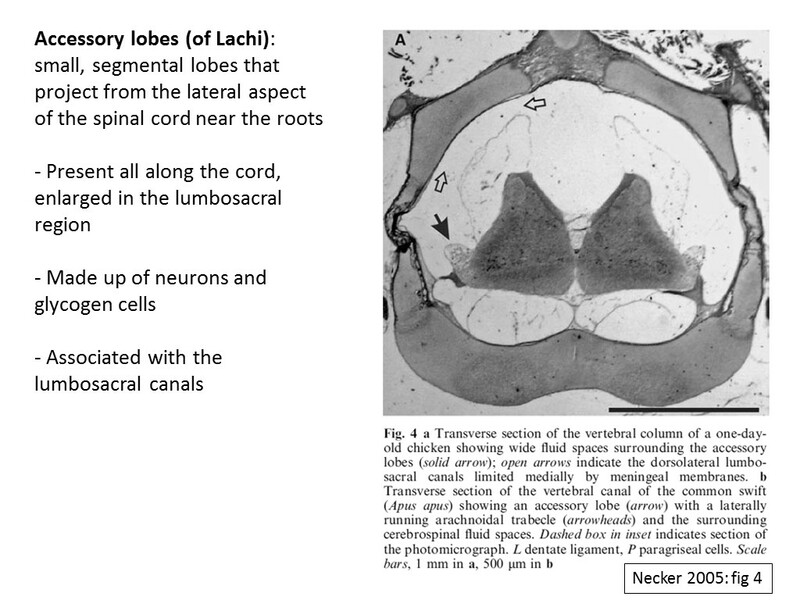 The idea that a second balance organ in the sacrum might be useful for flying species is definitely intriguing. 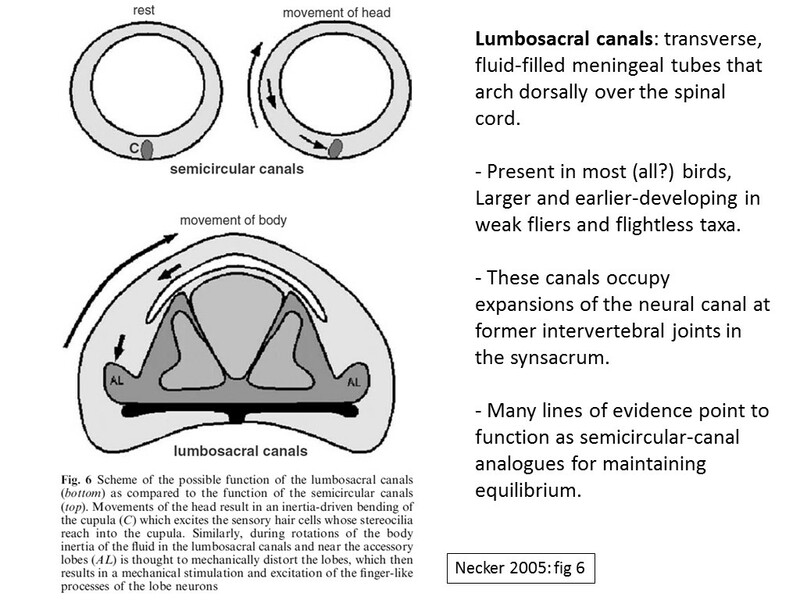 A counterpoint is that the lumbosacral canal system is larger and develops earlier in predominantly terrestrial birds. I suspect it correlates with amount of time spent walking, and might be another consequence of having the hip joint all the way at the back of the body. Even with predominantly knee-driven walking and running, birds may need balance organs at both ends to keep everything moving properly. Quite! It should be easy to test if the development of this system is linked to knee-driven rather than hip-driven locomotion, or if it correlates with something else entirely. Does this mean birds fly by the seat of their pants?? It would be interesting to know if Pterosaurs have something similar. Even lampreys and hagfish have semicircular canals (but reduced numbers of them compared to gnathostomes). The head-bobbing is in sync with the hindlimb step cycle, and I suspect that it’s to keep the center of mass over the feet even though the hip joints are so far back on the body. If it’s a bipedal adaptation, Poposaurs may also be relevant. I wonder if this adaptation helps birds to perch in trees at night? Diurnal volant birds that spend the night perching in a tree need to be able to keep their balance in the dark. A balance organ independent of the brain would also be useful for keeping balance while the brain is sleeping. They have to do all that on branches that may be swaying in the breeze as well. A tight perching grip would surely help, but without a way of balancing while asleep they might risk waking the next morning hanging upside-down (like a galah playing on a power line). To my immense irritation, Mike’s intuition seems to be correct. Or at least not yet falsified. Link. That treadmill experiment looks like a slam-dunk. 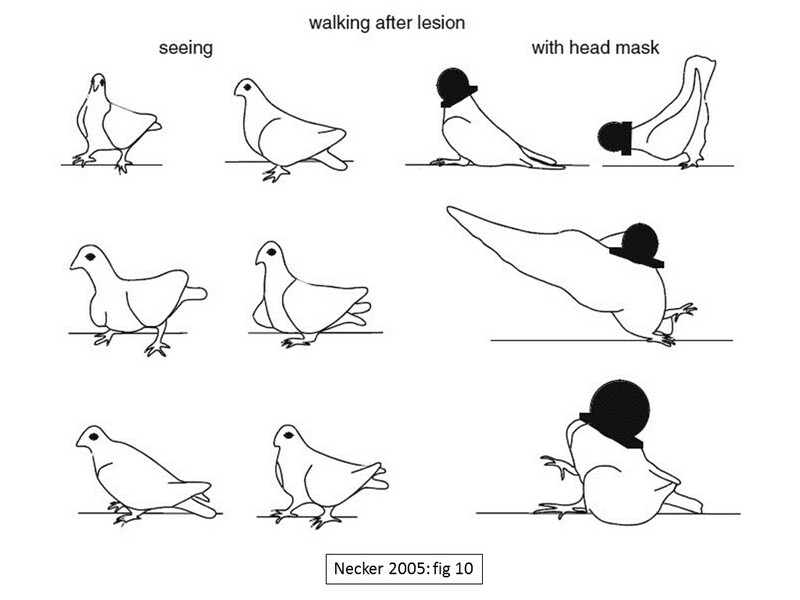 Surely pigeons bob their heads to get stereo vision ? Try moving your head from side to side to get the same effect. Not only Necker’s work has been somewhat forgotten, but the related paleontology work by Giffin (now Bucholz) is neglected. Sorry, John, your comment should not have been held for moderation: I guess WordPress erred on the side of caution because it included two URLs. So you posted it again: I’ve modded one through, and trashed the slightly less informative of the two near-duplicates. Thanks Mike! Chrome decided to crash on my 1st comment, oddly enough. Thanks for the heads up about Monica Daley’s work, John. I’m glad to know that someone is on this! Way too cool of a discovery to not get significant further investigation. 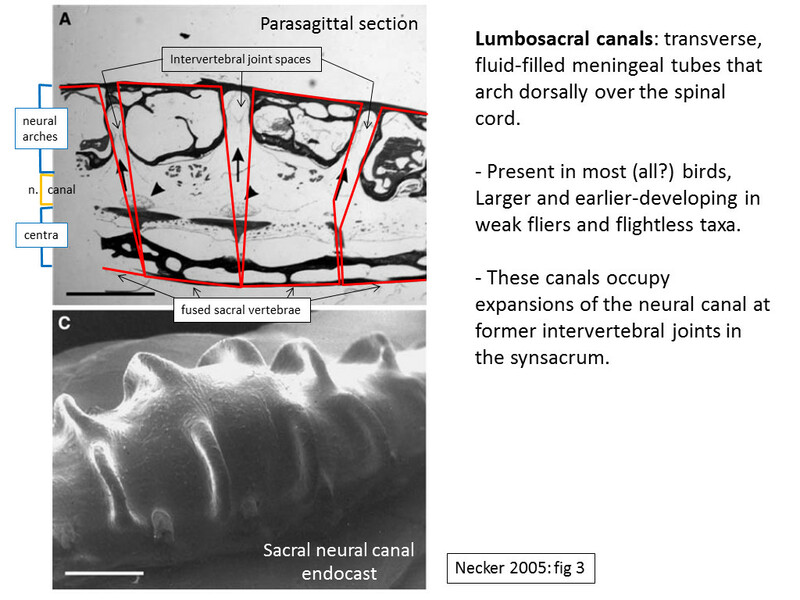 You are right about the lumbosacral canals probably not being present outside of Pygostylia if that’s the case. Should be straighforward to test if there are uncrushed sacra on either side of the divide available for CT scanning. « Did dinosaurs have a second brain to run their back ends?